Rose Marie "Rosemary" Kennedy (September 13, 1918 – January 7, 2005) was a member of the Kennedy family. She was the first sister of President John F. Kennedy, Senator Robert F. Kennedy, and longtime Senator Ted Kennedy. She was said to have substandard intelligence, with a mental age of between age 8 and 13. Family portrait. Rosemary is at right in the front row. Rosemary was born at her parents' home in Brookline, Massachusetts. She was the third child and first daughter of Joseph Patrick Kennedy, Sr. and Rose Elizabeth Fitzgerald. Although named after her mother, she was commonly called "Rosemary" or "Rosie". 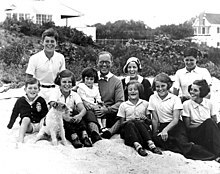 Rose Kennedy sent Rosemary to the Sacred Heart Convent in Elmhurst, Providence, Rhode Island, at age 15, where she was educated separately from the other students. Two nuns and a special teacher, Miss Newton, worked with her all day in a separate classroom. The Kennedys gave the school a new tennis court for their efforts. Her reading, writing, spelling, and counting skills were reported to be at a fourth-grade level. She studied hard but felt she disappointed her parents, whom she wanted to please. During this period, her mother arranged for her older brother Jack to accompany her to a tea-dance. Thanks to him, she appeared "not different at all" during the tea-dance. Rosemary Kennedy died from natural causes on January 7, 2005, at the Fort Atkinson Memorial Hospital in Fort Atkinson, Wisconsin, at the age of 86, with her sisters Jean, Eunice, and Patricia, and brother Ted, by her side. She was buried beside her parents in Holyhood Cemetery in Brookline, Massachusetts. ↑ "Sister of President John F Kennedy dies". The Daily Telegraph. 8 January 2005. Retrieved 12 January 2014. ↑ Weil, Martin (8 January 2005). "Rosemary Kennedy, 86; President's Disabled Sister (washingtonpost.com)". The Washington Post. p. B06. Retrieved 12 January 2014. ↑ Cornwell, Rupert (10 January 2005). "Obituaries: Rosemary Kennedy". The Independent. Retrieved 12 January 2014.